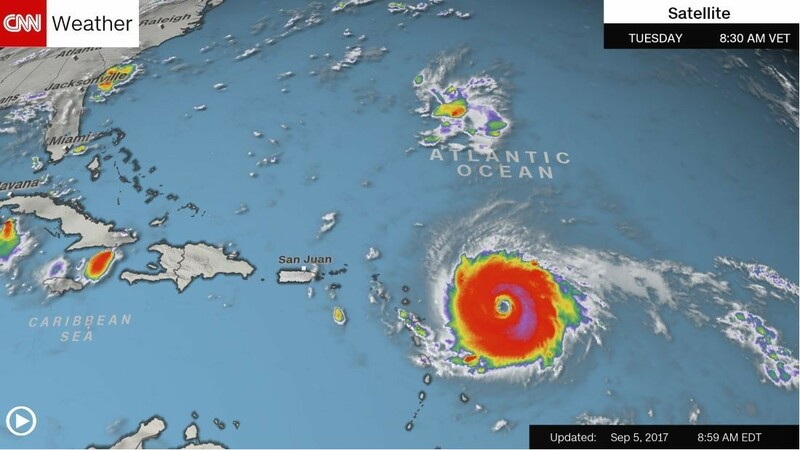 (CNN) As Floridians cleared supermarkets of bottled water and emptied gas pumps, people in the northeastern Caribbean were making last minute-preparations before powerful Hurricane Irma hit their islands. Late Tuesday, the massive Category 5 storm was almost upon islands like Antigua and Barbuda with near-record 185 mph sustained winds. In its 11 p.m. ET advisory, the US National Hurricane Center said the eye of the hurricane was 50 miles from the two islands. The center of the storm was moving to the west-northwest at 15 mph. The hurricane center said the extremely dangerous core of Irma would hit the northern Leeward Islands — which include Antigua and Barbuda, St. Kitts and Nevis, and Anguilla — Tuesday night or Wednesday morning. It’s too early to tell whether the storm will make landfall on the US mainland, but forecasts show it could turn toward Florida over the weekend. Forecasters’ most immediate concerns are for the people of the northeastern Caribbean, the hurricane center’s Michael Brennan said. “Anguilla, all the way toward (Antigua and) Barbuda, all the way up even toward the British Virgin Islands (are) in grave danger of an eye wall hit at (at least) 150 mph — that devastates the island, no matter what island it is,” CNN meteorologist Chad Myers said Tuesday. Those islands are under hurricane warnings, as are Puerto Rico, the US and British Virgin Islands, Montserrat, St. Kitts and Nevis, Saba, St. Eustatius, St. Martin/St. Maarten, and St. Barts. One Twitter user in St. Barts posted a photo of rain coming down and winds beginning to sway the leaves of the palm trees Tuesday evening. The hurricane center warned the storm is “potentially catastrophic,” especially if the worst conditions hit islands at high tides. Irma’s forecast track currently has it near or over Antigua and Barbuda, St. Kitts and Nevis, and Anguilla by early Wednesday, and the British and US Virgin Islands and Puerto Rico on Wednesday afternoon. The Dominican Republic issued a hurricane warning Tuesday evening that included coastal cities from Cabo Engaño to the northern border with Haiti. Preparations to protect life and property in those areas “should be rushed to completion,” the hurricane center said in an 11 p.m. ET advisory. “We could see storm surges of 7 to 11 feet — that’s certainly life-threatening — and very, very heavy flooding rainfall” in the far northeastern Caribbean islands as well as winds that could cause catastrophic damage near the eye wall, Brennan said. Hurricane warnings are issued to areas that are expected to experience hurricane-force winds (at least 74 mph). On Antigua, home to roughly 80,000 people, fishermen used machines to lift their boats onto docks and other residents flocked to stores to stock up on food and other supplies ahead of the storm, video broadcast by ABS TV Antigua and distributed by Reuters shows. The US Virgin Islands, with about 100,000 people, declared a state of emergency Tuesday and ordered the National Guard into active service. John Klein, owner of White Bay Villas & Seaside Cottages on Jost Van Dyke island in the British Virgin Islands, told CNN they were rebooking the guests. “We have backups for (our utilities), but in a storm of this magnitude it’s not best for the guests to be there because they may get stuck,” he said. Computer models show the system possibly near the Dominican Republic, Haiti and the Turks and Caicos Islands on Thursday and Friday, and Cuba on Friday and Saturday — and potentially turning north toward Florida by the weekend. One of those is the shortage of employees. Many workers recently retired or left their jobs for better prospects on the US mainland, Ramos Rodríguez said. Public schools and officials at the University of Puerto Rico campuses have canceled classes, and many businesses are closed. While Irma’s exact path is uncertain, Florida — where storm-wary shoppers were standing in long lines outside some stores Tuesday — is bracing for the storm. Miami-Dade County will start evacuating special-needs residents on Wednesday, and may announce other evacuations soon, Mayor Carlos Gimenez said. “I would rather inconvenience our residents” with evacuations than suffer loss of life, Gimenez said. Schools and county offices are to be closed on Thursday and Friday. And the state’s Monroe County, which includes the Florida Keys, said it will order visitors to evacuate by sunrise Wednesday, and residents should begin to evacuate 12 hours later. In Florida, people were standing in lines at stores to buy water and other goods on Tuesday. In Miami, supermarkets and other stores were already selling out of water and nonperishable food. “I’ve been through hurricanes and they’re like ‘Oh it’s going to hit right here’ and then it hits 30, 40 miles up the coast and it kind of changes the way everything goes, so better safe than sorry,” Greg Andrews told CNN affiliate WPLG. The lines at Costco in Pembroke Pines appeared to be several hours long, Javier Aragon tweeted. In Clearwater, along Florida’s Gulf Coast, a Publix store still was selling six-packs of water but had run out of larger cases, Carrie Hart said. Hart told CNN that workers there were trying to calm shoppers. On Twitter, she described a “mad run” on the remaining six-packs. “@publix is out of cases. Expecting more tonight. Store 1300. They are doing their best people. Calm down,” she tweeted. Irma could head to Florida by the weekend, Myers said Tuesday. “Just tremendous damage if we get this storm, this big, over parts of Florida,” Myers said. White House Homeland Security Adviser Tom Bossert tweeted that the President had declared emergencies for Florida, Puerto Rico and the US Virgin Islands. Scott also ordered 7,000 National Guard troops to report for duty by Friday morning. Of those, 100 were activated Tuesday to begin helping with preparations, he said. Irma has become one of the strongest storms recorded in the Atlantic, and is threatening to slam into Caribbean islands including Puerto Rico and the Virgin Islands with “potentially catastrophic” force on Wednesday, the National Hurricane Center said. Irma was churning west Tuesday evening in the Atlantic with maximum sustained winds of 185 mph — well above the 157 mph threshold for a Category 5, the hurricane center said. The last storm with sustained winds that strong in the Atlantic was 2005’s Hurricane Wilma, which weakened before it brushed Mexico’s Yucatan Peninsula, turned right and crossed Florida. Irma’s Atlantic wind speeds are behind only 1980’s Hurricane Allen, which peaked at 190 mph at sea. Another storm, Tropical Storm Jose, is 1,500 miles east of the Lesser Antilles. “Interests in the Leeward Islands should monitor the future progress of Jose,” the hurricane center said.